The instigator penalty in one form or another goes back to 1937 when the the league stated that “A major penalty shall be imposed on any player who starts fisticuffs”. It made sense. It was straight forward, no loopholes, no conditions and it left room for the referees to enforce the rule as they deemed appropriate. In 1992, though, the NHL upped their game by adding that players should be assessed a game misconduct if they instigated a fight. In 1996, the NHL upped the punishment by making it possible to assess a two-minute minor, a five-minute major and a 10-minute game misconduct, for a grand total of 17 minutes of missed time. The NHL was trying to increase its fanbase and thought eliminating fights from the sport would make it more popular. There were some side comments about possibly reducing injuries as well, but essentially the NHL wanted to expand their market and generate more revenue. And, theoretically, they thought it might keep their star players from getting injured. They thought wrong. Unfortunately, the rate of concussions has increased dramatically since the advent of the 1996 change. Future Medicine published a report including the table below, tracking the NHL incidence rate of concussions from the 1986-87 season through the 2011-12 season. 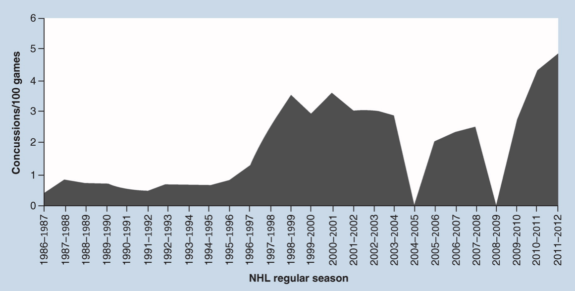 The graph shows the rate of concussions rose 10-fold from 1986-87 to 2011-12. Two seasons have no data to be included – during the 2004-05 lockout and 2008-09 when they couldn’t find published data for the season. It’s worth noting that that Rule 48 was implemented in 2010-11, which was specifically designed to address illegal checks to the head, defining the contact and the penalties to be assessed. Ironically, the 2010-11 and 2011-12 seasons saw the number of concussions increase even more, reaching the two highest points over the 26-year span. Another important note. Fighting accounted for nine percent of concussions with one report showing the risk to be .39 percent per fight. So fighting has never been the major cause of concussions in hockey. Hits are. Not only did the instigator rule not prevent concussions, arguably one of the most dangerous injuries facing professional hockey players, it looks like it actually led to more concussions. And the damage hasn’t stopped there. 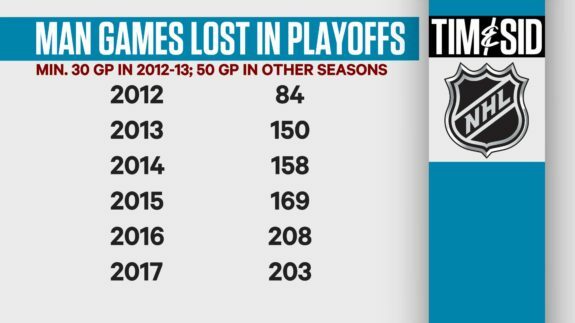 According to Sportsnet, the number of man games lost in the playoffs has been on the rise as well. So much for helping to protect the players. The 1996 rule change created such costly penalties that teams couldn’t afford to pay the price to put nuisance skaters in their place. The current crop of cheap shot artists include the likes of Tom Wilson, Matthew Tkachuk, Ryan Kesler, Zac Rinaldo and Brad Marchand, just to name a few. 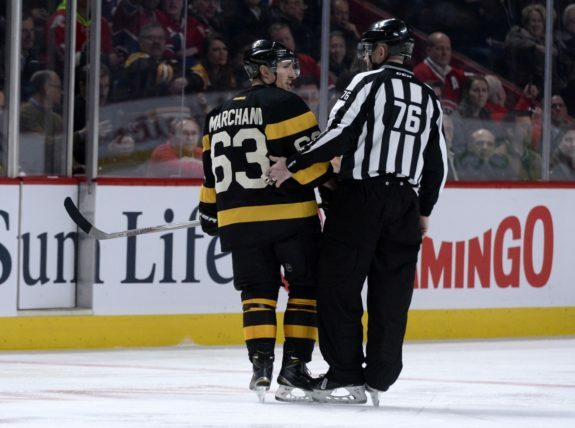 As often happens in such a fast-paced sport, the referees may miss the initial questionable hit and end up penalizing the player who responds. Over time, they may get the sense a guy is creating problems, but if they don’t catch him in the act, he doesn’t get a penalty. 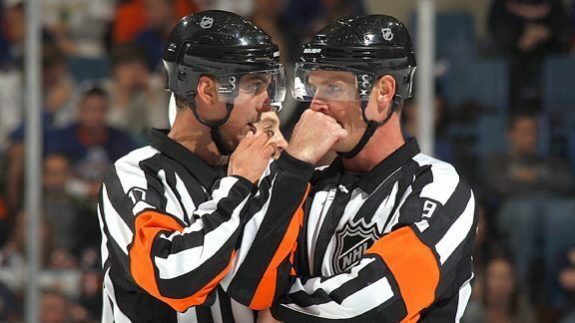 Instant replay will show every missed call, but the on-ice officials have to make those rulings in real time. The referees rarely get the luxury of hindsight. Before the instigator rule, a player who laid a cheap shot on an opponent needed to be prepared to defend himself later. Teams could control the amount of dangerous play by holding opponents accountable and not allowing players to beat up a star scorer without facing someone more adept at the physical side of the game. It kept the players honest. But few teams can afford to lose a top-tier player for 17 minutes. Even losing a fourth-line player for that much time can create problems. And there’s no guarantee the true ‘instigator’ would actually serve any time in the box. Despite the NHL expanding the rule book, the number of players spending large amounts of time in the penalty box has actually decreased, which is ironic if the purpose of padding the rule book is to limit injury. Concussions have increased astronomically concurrent with the rule changes. Either the rules don’t work or the officiating isn’t able to apply them appropriately. In looking at the course of penalty time assessed over the last 10 years, one can see that while the rule book has expanded, the number of players serving big minutes has decreased. 2008-09 – 18 players logged over 150 minutes in the penalty box over the course of the season, with one player serving over 200 minutes. 2009-10 – 14 players served over 150 minutes in the box with four players exceeding 200 minutes. 2010-11- 14 players racked up over 150 penalty minutes, with two going over 200 minutes, one of whom logged over 300 minutes in the box. 2011-12 – eight players had over 150 penalty minutes with two going over 200 minutes. 2012-13* – (lockout-shortened 48-game season) – one player exceeded 150 minutes. 2013-14- seven players logged over 150 penalty minutes with three going over 200 minutes. 2014-15- four players served over 150 minutes with one passing the 200-minute mark. 2015-16- three players racked up over 150 minutes with none passing the 200 threshold. 2016-17 – one player logged over 150 minutes in the box with none hitting the 200 mark. 2017-18 – two players had over 150 penalty minutes with one crossing the 200-minute threshold. Just because the amount of time spent in the penalty box has decreased over the past decade, that doesn’t mean the cheap shots have. In fact, one could argue the dirty players are actually getting away with more because they aren’t getting called for their shenanigans and their opponents don’t believe they can defend themselves without taking the risk of 17 minutes without a key player. 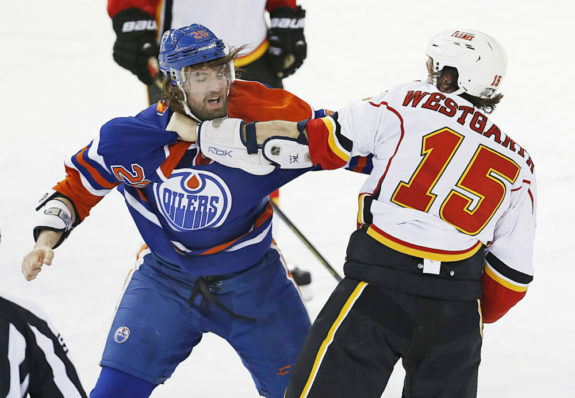 The instigator rule may be limiting fights, but it isn’t protecting the players. It’s allowing dirty players to thrive. And that has to be worse for hockey than two players facing off in an effort to guard their teammates. Either the NHL gets serious about guarding the players from preventable cheap shots or they need to let the players do it. The instigator penalty is only making the game more dangerous.